April showers might bring May flowers, but March had a downpour of Munchkin and Ogre releases to quench the thirst of even the biggest SJ Games fan! Look for them in your friendly local game store! Adventure with Scarecrow and the Tin Woodsman! Brave the Poppy Fields or the Deadly Desert! Fight against a Wicked Witch or King Krewl! Visit the Emerald City and talk with Dorothy, Ozma, or the Cowardly Lion! Play a Professor, Royalty, Soldier . . . or even a Wizard! The Oz books have been favorites of children and their parents since the books were published over a century ago. Create your own adventure with Munchkin Oz! L. Frank Baum wrote 14 books about the marvelous land of Oz, so try as we might, there was no way we could fit all those adventures and characters into one game. 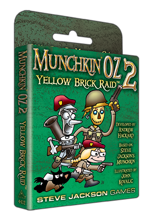 That's why we've made 56 new cards to shuffle into your original Munchkin Oz deck – it's a Yellow Brick Raid! Whether you're a fan of Baum's books, or you've always meant to read them but never have because reading is hard, now you can experience the fun of the Oz setting in even more detail. 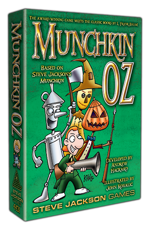 Munchkin Oz 2 – Yellow Brick Raid is an expansion set; you will need Munchkin Oz or Munchkin Oz Guest Artist Edition to play. 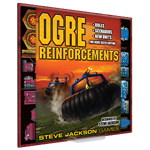 Get even more out of Ogre Sixth Edition with its first expansion! Ogre Reinforcements includes three Ogres for the Paneuropean faction, a complete set of basic armor and infantry, as well as two 3-D Command Posts for the Combine faction and five new types of armored units for both sides. It also comes with town overlays for the map, which add new complexities to movement and defense. You'll also find eight scenarios, including five written by Ogre designer Steve Jackson! It's the game every mutant has been waiting for! Join the X-Men on a thrilling adventure to defend mankind from renegade mutants. 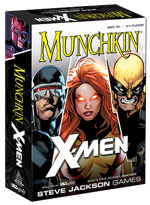 Munchkin: X-Men Edition combines Marvel's beloved collection of X-Men comics with the roleplaying fun of Munchkin. Be students attending Xavier's School for Gifted Youngsters and team up with Professor X, Wolverine, and more super-charged mutants to take down the likes of Sabretooth, Juggernaut, and the almighty Magneto. Find all this and more at your local game store!